This is what I've tried and found works for me. You may have different preferences - do choose whatever you're comfortable with. These are mainly hints for those who are getting started and wonder what other people use. If you need explanations for words used below, try the mini glossary page or turn to a hobby tools catalog like MicroMark to read about the tools (see Supply sources page). 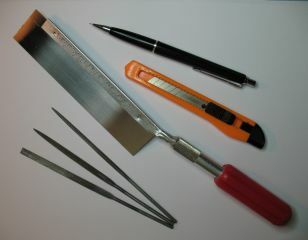 A sharp X-acto or scalpel type knife for cutting card and thin pieces of wood, and a utility knife for cutting thick boards and nasty things like sandpaper. I have a small cutting surface on my work table, and a larger one which I take out and put on the floor when cutting large pieces of illustration board for structures etc. The cutting surface on my desk is a piece of some type of cardboard that is very hard (don't ask me what it is, because I don't know - we happened to have some pieces of it, and it works). For cutting large pieces, I have a large cutting mat (originally intended for quilting, but it's not the "self-healing" kind). I also have a chopper which I find very convenient for cutting thin basswood strips. My model didn't come with a centering rule, I bought one seperately a couple of years later and applied it (it's self-sticking). If I'd known how good it was, I'd have bought it in the very beginning. Do take care to 1) centre it exactly, and 2) not cut yourself at the chopper's blade while applying the ruler. Be sure to have plenty of spare blades for both X-acto and chopper, they dull quicker than you might think, and sometimes you really need to have a fresh one. For cutting moldings, dowels, and other thick pieces of wood, I have a miter box and saw set. They come with a 24 teeth per inch blade as a standard - do buy a 54 tpi replacement blade, it's much better suited to cutting mini wood! I usually build 1:48 scale structures from plywood rather than illustration board, and my husband cuts the plywood for me on a band saw. Of course, this is entirely optional (he did have the band saw already). Stiff, flat, brushes; #4 for applying creamy paint to furniture, and preferably a larger one for painting walls. Soft brushes #1 and #6 or #8, for applying liquid stain, Danish Oil, washes, and thin paint, to furniture and floors. A big, soft, brush for dusting miniature interiors. A 3/0 or smaller brush for painting drawer knobs a different color. Sorry - I have no hints on decorative painting, but I think cut-off pins are used for really small details. I have a set of micro drill bits and a spiral push drill for hand drilling, plus a small Dremel-type drill. And a big pin for indenting the wood where I want the hole to be. I really think the drills may be the tools that I use the least. If I was re-stocking at a very low budget, I'd probably skip them until I was really missing them. Especially the power drill - I doubt that I use it once a year. A ruler with 1/32" markings, if possible (or a metric ruler, if you use wood strips with metric dimensions). I use one with 1/16" markings, and that works too if you're precise. For cutting, a cork-backed metal ruler is usually recommended (it won't slide, and won't get a jagged edge from the cutting - I confess that I do not own one, but I've thought of getting one). A square for getting the angles square when marking cutting lines. A circle template is good for table tops etc. For marking cutting lines, I use a 0.5 mm pencil and an eraser. I also have a set of permanent pens for signing finished minis. Don't use the pens on unfinished wood without testing on a sample first - they may bleed! If you sign it on a surface treated with a clear sealer the pen won't bleed. You can buy a set of needle files in hobby or hardware stores (flat, round, oval, triangular, square, etc) for a few dollars. I bought a fancy set of expensive hobby files too, but I haven't used them for years. I use the files for removing excess wood from complicated shapes like this bedstead, and for enhancing the shape of turned toothpicks, as well as for other things. I have a slightly larger file too (one side flat, one side rounded), which I use for shaping pieces of balsa that I turn into upholstered furniture. I buy sheet of sandpaper in #360 and #600 grit in the hardware store, cut 5 mm (3/16") thick foamcore in 5 by 8 cm (approximately 2"×3") pieces, glue them onto the back of the sandpaper, write the grit on the back, and cut out when dry. Great for sanding small pieces of furniture, as well as floors etc. For a very smooth finish on wood, you can sand with a piece of a brown paper bag between coats of Danish Oil. Start with white wood glue or Tacky Glue. Note that though Tacky Glue is often easier to handle than wood glue is, it dries a bit flexible which may or may not be an advantage. Tacky Glue is great for upholstering furniture (wood glue bleeds through the fabric), though you'll have to be careful if using a thin or delicate fabric. If you want to glue metal or plastic, you'll need some type of CA glue too. A draw plate if you want dowels of less than 1/16" diameter (it works, but I seldom use it - I don't need very much of thin dowels). A balsa stripper for cutting balsa wood along the grain to the exact width you want (no, it doesn't work on harder woods like basswood). I use graph paper for designing furniture on (it's best if it has squares the same size as the thickness of the wood you use). I keep these on or near my work table, and use them all the time. Roll of toilet paper for wiping. Flower pot or similar for table-top wastebasket. I use mine all the time, and once in a while I empty it into the regular-size waste-basket (which I keep pushed well under my desk, so things won't drop into it). In case I'd drop something into the table-top wastebasket, it would be easy to search it through. I think the flower pot should be lightweight so it's easy to empty (e.g. sheet metal or plastic rather than clay), and of course it shouldn't have a hole. Coasters are good for keeping parts while your working, or a mini that you're putting aside to let the glue or paint dry. For larger pieces, I use a small tray (about 15×20 cm or 6"×8"). Ziploc bags and small containers with secure lids to keep parts for your work-in-progress in (film containers used to be good for that). Sheet of paper to use under your work, for a clean surface every time (you can recycle discarded printouts etc). Waxed paper is good if you're a messy gluer. Coffee stirrers or popsicle sticks for stirring paint. Wipe off immediately afterwards, then you can reuse it when dry. You can also use them as temporary handles for e.g. miniatures that you are painting (stick it with double-stick tape underneath the base of the mini). 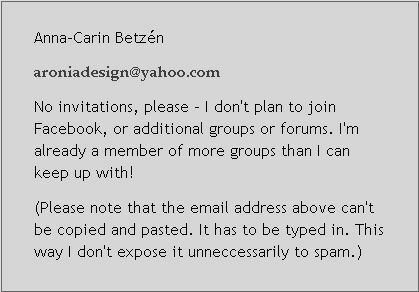 © Copyright Anna-Carin Betzén 2003, 2010.